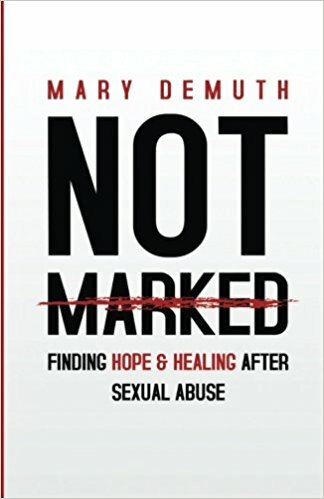 Mary DeMuth’s Not Marked is an excellent resource for Christians who want to break free from the bonds of sexual abuse and assault. The author clearly summarizes the impact of sexual trauma on the individual’s psyche and future relationships, from coping with intrusive thoughts and memories, to reestablishing one’s ability to trust others, and navigating physical intimacy during recovery. DeMuth speaks with an honest voice, and wisdom that has been hard won through personal struggles. Rather than providing pat answers for men and women who strive to be fully emotionally and physically present for their partners (despite their sexual wounds), DeMuth gives specific descriptions of common perceptions and problems experienced by trauma survivors in relationship to themselves and others. She follows up with sound advice for change, such as the importance of sharing one’s story, setting boundaries in relationships (including openly discussing triggers with one’s partner), and the power of forgiveness. In addition, this author is able to weave in her wit while discussing very painful topics, which is likely to be helpful to individuals processing abuse memories. For example, she is able to appropriately poke fun at circles within evangelicalism that conduct workshops on becoming a more exciting sexual partner, and the failures of said workshops to address the sizeable number of persons present with a history of sexual abuse or assault. She also expresses intolerance for the ways in which our judicial system, churches, and schools still sometimes ignore reports of sexual crimes, allowing those in positions of power to abuse others unchecked. It should be noted that due to the author’s lack of mental health training, there were a few frank inaccuracies in the book, which were largely confined to Appendix 1. For example, the author suggested that night terrors may be a sign of sexual abuse (p. 227), when they are in fact a sleep disorder and are not associated with a history of abuse (nightmares on the other hand, may be associated with abuse). Another inaccuracy was the suggestion that head banging and cutting may be a sings of abuse (again p. 227; head banging is usually associated with pervasive developmental disorders rather than abuse; cutting is usually associated with personality and/or dissociative disorders, wherein a history of trauma may or may not be present). Still, the author was quick to suggest that persons who have a history of sexual abuse or assault should consider professional help when needed. Thus, it was opined that the benefit of the book to readers would far outweigh any risk related to misinformation contained in the book. One last caveat to readers would be that the book does contain detailed descriptions of the author’s own sexual abuse history (about which readers are forewarned at the appropriate juncture in the text). This means that readers with a sexual assault or abuse history should prepare themselves for the possibility of experiencing flashbacks or body memories of assault or abuse, and have support systems in place should they be needed. In fact, this reviewer felt that reading this book while in professional counseling or when meeting with a small group (wherein memories and their interpersonal impact can be processed), would be the ideal combination. Included in the text are specific assignments for processing abuse memories, shame, and forgiveness (such as writing a personal psalm of lament, which would ideally be shared with a counselor, friend, or family member).